When someone is the subject matter of a film memoir, they must have a magical quality if they are never physically seen – either in person or in the form of archive footage – yet leave the viewer with the impression that they have met them and that their presence permeates every aspect of the work in question. Such is the case with Kiss the Water, the bewitching new biographic documentary by American filmmaker Eric Steel, about the reclusive Scottish spinster Megan Boyd. Megan became a legend in her own lifetime thanks to her uncanny ability to produce fishing flies which were not just highly prized amongst the worldwide angling fraternity, but also became collector’s items with people who appreciated her delicate works of art for their craftsmanship and mesmerising beauty. Kiss the Water is, like its subject matter, something of an enigma. Here is a film that can be watched in several ways, each equally satisfying to the viewer, yet the overall feeling of which is hard to pinpoint. Is it a look at the life of Megan Boyd, a snapshot of the mystifying appeal of fly fishing, or an entrancing portrait of one of the wildest and most isolated areas of Britain and the people who make it their home. In Megan the film reveals a woman who lived as far removed from the modern world as you are able to get whilst still situated, albeit on the periphery, of contemporary life. Explained in interviews with members of her small group of friends and people from the local community of Brora, the area in the Scottish Highlands where she moved to from England as a child and lived in until her death at the age of eighty six in 2001, the result is a fascinating glimpse at the life of a woman who, on the face of it, appeared to exist solely for her art. However as her friends reveal here in their candid and fond recollections, Megan was a popular and cherished member of the local community. 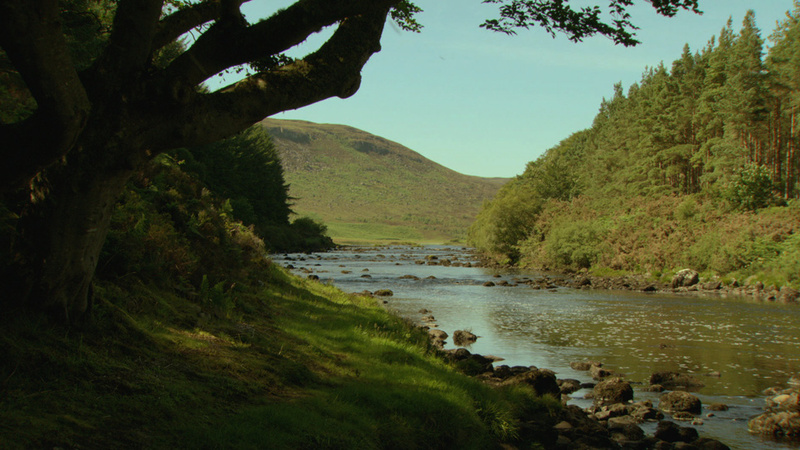 The film also focuses on the art of fly fishing and love (some would say obsession) that those who do it have for the sport. People who partake in this – what to outsiders may seem lonely – pass-time, have great respect for fellow anglers and, though Megan herself never actually fished, the admiration that fishermen felt for her is clear. Through a mix of letters and anecdotes (including some from a member of the British establishment who held the eccentric artisan in particularly high esteem) the film paints a picture of a woman whose workmanship and dedication to her trade is sadly a thing of the past in our throwaway world of short-lived, mass produced goods. Like Megan’s flies, which she created from an eclectic fusion of feathers, twine, ribbons and hooks, Kiss the Water can be seen as a work of art in itself. The sparse beauty of the Scottish coastline where she lived and worked in rural isolation, is captured with a mixture of footage filmed in the remains of Megan’s ruined cottage, the said interviews with those who knew her and animated sequences by British artist Em Cooper which blend seamlessly with the live action and a soundtrack by composer Paul Cantelon. Steel – whose previous work as a director was The Bridge (2006), a documentary which juxtaposed the grandeur of San Francisco’s Golden Gate Bridge with it’s less appealing reputation as one of the world’s most notorious suicide spots – captures in Kiss the Water the essence of the perfect documentary, namely letting the subject speak for itself with minimal interference from the filmmaker themselves. As with the miniature gossamer fantasies which Megan Boyd spun from nothing and which live on in the hands of fishermen and art lovers around the world, this enchanting film remains etched in the mind long after it has ended and the viewer has returned to a reality which seems somehow drab compared to her colourful and haunting private world.